Cho-Sen Village, the third installment in the Chinese takeover of the Queens and Long Island area by restaurateur Neil Wallin, has completed its first year to rave reviews by the people of Great Neck. They are busy, not only because they are the only Chinese restaurant in town, but because they make everyone's experience a memorable one. This colorful and stylish restaurant, decorated by Neil's wife, Bucky, boasts a large private dining room as well as a private party room to the side and a VIP dining area. They also have a full service drink and sushi bar. For your convenience, there is ample parking in the municipal parking lot next door. The master chef of all three restaurants is Chef Cheng. Born in Taiwan, he has worked for the last 30 years with Glatt Kosher Asian Cuisine. When Neil opened up Cho-Sen Garden, he became Head Chef and is now approaching his 16th year. His cooking style is a fusion of traditional Cantonese, Mandarin, Szechuan and Japanese, which has earned him the Queensboro President's Award as well as the Governor Pataki Community Service Award. 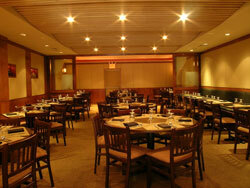 Chef Cheng has now brought a delightful Chinese cuisine to great Neck that artfully surpasses guests' expectations. At Cho-Sen Village be prepared to experience traditional Chinese fare at its best.